Geordie Armani puts her heart and soul into this blog. The devil is in the detail and if you want to get the detail of where to eat out in Dubai then this is the blog to read. A great place for local insight on what's happening in the UAE. A real blog written by a real person with real views - not paid-for-publicity. Always look forward to the next post and GA often makes me smile! keep up the great work. brilliant blog, wouldn't eat out without it! Fantastic honest and fresh views which i have started following with anticipation for the next review. Would recommend anyone who enjoys trying places to eat and drink they may not have heard of before! 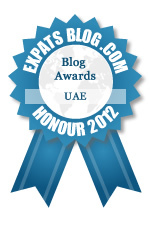 On of my favourite sources of information about what to do & where to eat in the UAE! Always look forward to reading GAs views on all types of venues! Read this, it is a must if you are looking for real, insightful and honest reviews. The REAL Geordie Armani Blog is simply Great, informative & honest blog with one hell of an energetic and vibrant lady behind it.. Informative and always fun to read, been a fan of this blog for a while! GA excels at uncovering foodie gems around Dubai - with a good dose of humour! A very honest and refreshing blog, love the simplicity and straightforward comments and opinions written by a true foodie and the humor is a bonus. Always interesting and very genuine reviews. Great tips all year long from the real Geordie Armani. Try it out you all ! One of the best blogs to find up-to-date information on anything and everything you need to know about eating in Dubai! After being in Dubai for 2 years now, I have recieved loads of tips via this blog. GA was the first person I started following in the region. She's provided countless reviews, tips and advice ever since. Keep it up and WELL DONE! Thank you GA!! Honest, informative, always on the ball.....superb blog! Honest reviews and fun to read. GAs Blogs! ,Interestingly informative, To the point and True! I knew Geordie just yesterday, but never is late to meet brilliant people. I'm watching is blog and facebook, they are wholemeal, clears with funny notes and quiet fresh. I like her down to earth style! I used her advice when in Dubai on a business trip and was not disappointed. I love the honest and simple way she talks about food and places. Recommended reading. We love our food & eating out wherever we are ,so I love this blog .It's fun, honest & gives you the real deal on all sorts of eateries. A big thumbs up from us and long may it continue. Invaluable I'd say. Always spot on advice, love the variety of eateries! Keep up the great work! Excellent site. So much help and information for people to access. Geordie Armani keeps it real - honest, interesting, warm and approachable. Always helpful, often funny. Love her style! Awesome reviews! Reliable source of information on new foodie places in the UAE. Geordie's reviews are always spot on. The blog has become my lovely lil UAE food guide. Good job. A very down to earth, no-frills review of restaurants in the UAE. All the while written in perfectly understandable language without a lot of the foodie jargon the others use. Website design is simple and easy to navigate, and has had me searching for Geordie Armani + 'Restaurant name' almost every time I want to try out a new place. Plus connections to Facebook pages and Twitter account makes sure we're always updated; a lot of dedication put in there! A great blog and made my move to the Middle East so much easier!